"This is a recipe we created one night when we wanted a salad for dinner, but were all out of standard salad ingredients. It worked out wonderfully, and is something that we'll definitely make again." 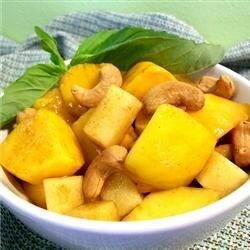 In a medium bowl, toss together mango, Granny Smith apple, cashews, balsamic vinegar, cinnamon, ginger, and salt. This is a strange set of ingredients that really work well together. Great! An easy but different recipe for fruit salad. Next time I will try it warm w/ vanilla ice cream for dessert! This had good texture but the flavors didn't quite meld. It also was a little tart for my taste. A little too much cinnamon. The recipe was interesting but didn't quite hit the mark. this was so unexpectedly delicious, and my husband loved it too! Have already made it 3 times.